Endorsed by the Official ITIL Accreditor and updated in line with the 2011 syllabus, the bestselling study aid Passing Your ITIL 2011 Foundation Exam is the ideal companion for students preparing for their ITIL Foundation Exam. The publication presents the Foundation content in an easy-to-follow structure, which is ideal for learning, and developing an understanding of the basic concepts, principles and terminology associated with IT service management. 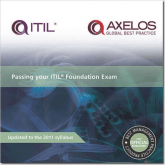 The publication provides an overview of the ITIL Foundation learning requirements. It contains chapters on service management, each of the five lifecycle stages, and service management technology - plus information on the qualification scheme and the exam itself. Topics are presented in a logical easy-to-absorb structure. A fictional case study helps to bring service management to life. Mind maps summarise content at the end of chapters and are excellent revision aids. 73 completely unique questions, which you will not find anywhere else! Answers to all questions are thoroughly explained to aid understanding. Find out more about Accredited ITIL® training.